Warwickshire Fire and Rescue Service have cut deliberate small fires by nearly two-thirds and fire related injuries by more than a quarter in the past year. pite a fall in retained availability from 81% in 2011/12 to 70% in 2012/13, the Service has also delivered in excess of 3,800 targeted home fire safety checks over the past 12 months leading Warwickshire chief Andrew Hickmott (pictured) to praise the contribution of new teams focusing on arson reduction and small fires. "The annual report shows some very impressive reductions, especially with the levels of arson, which have been reduced by 61%," said CFO Hickmott. "This is credited partly to the introduction of the Small Fires Unit, but also the Arson Reduction Team and the BIKE Team, all of whom have made significant contributions to reducing arson in hot spot areas through community engagement and partnership work." Other significant areas of progress include a 23% reduction in property and vehicle fires and a 9% reduction in accidental dwelling fires. The economic cost of fire has also been reduced by 45.2% in the last two years from £20,664,121 in 2010/11 to £11,324,256 in 2012/13. "Clearly a lot of work has been undertaken here in Warwickshire to protect the community and make Warwickshire a safer place to live. 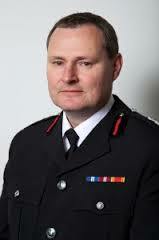 As a new Chief Fire Officer, it is reassuring to know that I have come to lead such a high performing authority and I know that will continue as we move forward to deliver an excellent service."